​A group of interested non-governmental organizations (NGOs) was therefore invited to together prepare a draft outline of the key elements to be included in this handbook. This outline was shared with field partners around the world for comments and feedback. Based on the feedback, a revised annotated outline was prepared, which served as the basis for the first draft of the handbook, including its layout. Download and learn more. The cry of the Earth and the cries of the poor can no longer be ignored; a response is urgently required. Indeed, Pope Francis’ historic Encyclical, Laudato si’, has sent a powerful message about the urgency of the environmental crisis to the whole world. As Franciscans, we are called to “cooperate as instruments of God for the care of creation” in every way possible. This study is available for download free. It can be downloaded in several languages through OFM.org. or directly as a pdf. This is another great option for individual study or with your fraternity. 'Destroy the meter/Enjoy free water", Orange Farm, South Africa story inspired these delegates. To draw from their tradition, to promote respectful use of water among them. To be the conscience of the local community. To act in solidarity with the marginalized who have no access to safe water and adequate sanitation. To stand with people who are deprived of the rights to safe water and adequate sanitation and to journey alongside them. Protect the right to water by preventing third parties from commercializing our water. Empower local governments and local communities to manage water supplies. Use a participatory approach in managing water (involve users, planners and policy makers). Ensure that everyone has physical and economic access to safe, hygienic, secure, socially and culturally acceptable sanitation, that provides privacy and dignity. Refrain from waste management practices that infringe negatively on access to safe water. Prioritize sanitation facilities in informal settlements and impoverished rural areas. The Seven Last Words of Jesus booklet invites us to reflect on Jesus' last words in relation to current issues affecting people who are marginalised globally. With concrete examples citing tradition, beliefs and unjust legal structures, we are asked to hold them in our prayers. We encourage you to share this booklet within your communities, parishes and work places. It is also available in French, Spanish, Italian, German and Chinese. The Way of the Cross pamphlet citing examples of inhumanity and injustice, helps us to focus on JPIC concerns and pray for the work of Franciscans International and our own vocations as Franciscans in the world and in Franciscan Fraternity. The black and white art-work brings global, modern-day suffering in to focus and will help us in our meditations each Friday of Lent and especially Good Friday. You can download the booklet directly from the FI site. 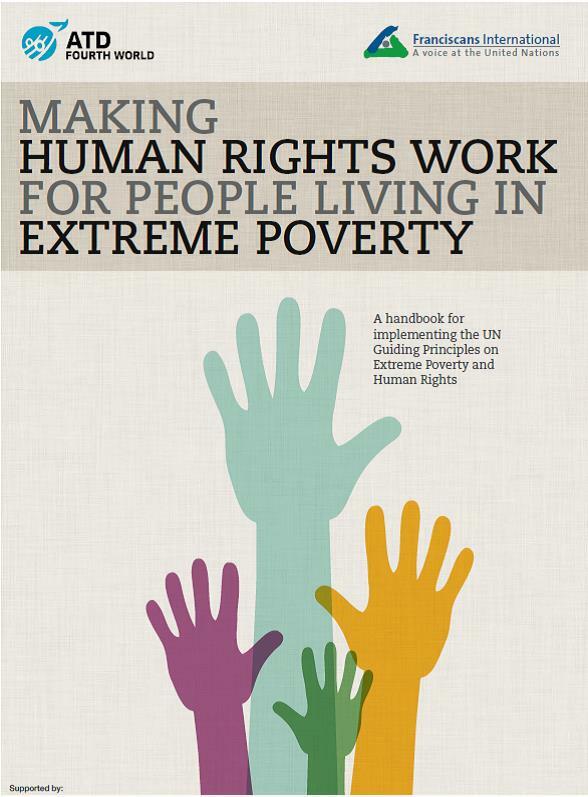 This FI booklet is a great introduction to their advocacy work, highlighting 10 case studies of injustices they have addressed through the UN or other international fora. It makes an excellent, short JPIC study for OFS fraternities with first-hand accounts of the experiences of FI's Franciscan partners at the grassroots around the world and their collaboration in bringing crucial human rights issues to the attention of leaders at the highest international level. Readers are invited to consider each case study from both a practical and a spiritual perspective. FI hopes it will challenge us to reflect on the contribution we can make in seeking justice in our communities, in our country, and across the world. Please click on the image above or here to read or download. Franciscans International published a booklet entitled “Development: sustainable for whom? Reflections to understand contemporary challenges.” The booklet, published in November 2013, contains six central sections, each dealing with a distinct area of concern in the field of sustainable development. These include an examination of the relationship between development and extreme poverty, a critique of the concept of green economy, FI’s perspective on climate change and reflections on the specific sustainable development issues of water access, food and agriculture, and natural resource extraction. These all relate to the suggested key issues in the Canadian OFS National JPIC Action Plan. This 2012 report prepared by Franciscan International "Modern Slavery in India: Cases of Bonded Labour" relates cases of contemporary forms of slavery from the first-hand experience of Franciscans and partners working in India. Examining issues surrounding child labour, prostitution, human trafficking, and forced and bonded labour in industrial and agricultural sectors in India, this publication serves as a comprehensive introduction to the scourge of global, contemporary slavery and the challenges we face in eradicating this serious violation of human rights. This report can be downloaded by clicking on the image or here. This practical guide can be downloaded by clicking on the image or here. On 28 July 2010 the United Nations General Assembly officially recognized the Human Right to Water and Sanitation. To help make this Human Right a reality, Franciscans International and WaterLex co-developed a learning manual for grassroots religious communities to provide the Franciscan Family and any other interested stakeholders with an overview and some tools to address water access and governance challenges in everyday life. Over seven sections, this 32-page document progressively explains how to become aware of water and sanitation challenges as well as the planning of facilitation and advocacy activities at the local, national and international level. Throughout the guide, questions are raised which can be answered while reading.